So goes the opening line to the Telling the Bees’ marvelous song “The Worship of Trees.” On the particular Youtube version below, these words come just a little after the 1-minute mark. Druids are named for their association with trees, and I can think of no better way to communicate a Druidic response to the previous post, where in one section I talked about salvation as just one religious and spiritual alternative in spiritual practice. Druidry doesn’t seek salvation so much as wisdom and connection. If this is atavism, let’s make the most of it! “Something deep inside of me yearns to be free.” This freedom is not merely a negative “freedom-from,” but a positive “freedom-for.” What do we long to do, what would we do, if we could? Unlike in “spiritual pollution” religions, in Druidry sin doesn’t eternally hold us back (though poor choices can for a time). The blessings of the natural world can heal more than we imagine. Especially when we see how large the borders of the “natural” reach, and how we and our bodies and our sciences and arts and spiritualities, our planet and solar system and galaxy, fit cozily in one small cosmic cubby. “Lately I have touched the sublime, out of sight out of mind: the worship of trees.” It’s dangerous to state absolutes about something as fluid as Paganism or Druidry specifically, but I will nonetheless: most Druids accept the existence in some form of more than one plane of existence. Note I don’t say “believe “– it’s not a creed to recite each full moon, but an experiential awareness that the cosmos vibrates up and down a very wide range, and our human experience is only part of the bandwidth. Ecstatic experience can for a time open us to other portions of the band, and broaden our sense of its range and of what’s humanly possible too. “Lately I have been flung into rustication: the worship of trees.” Part of the Druid experience — again, here I can generalize — is a sense of being part of something much larger than human only, something that sweeps us up in its flow and carries us with it along with everything else, in a direction that isn’t different from where we’re going anyway. It’s a harmonic of existence, and so it’s not something to fear or resist, but to study and harmonize with in our own ways, as each species does. Note that the existence of so many distinct species shows the flow needn’t extinguish individuality — it can also manifest through it. What is it in the flow that calls us with such a strong imperative? Only as humans can we deny or ignore the summons, though ultimately we’re borne along willy-nilly anyway. “I’m too far in …”: some practices and ways of being in the world aren’t wholly “safe.” They may change you, change the environment, and have unforeseen (though not unforeseeable) consequences. John Beckett talks of “a certain forest god” he serves, Cernunnos, whose worship isn’t always comfortable or easy. And to take things one more step, to the madness which exists in so many shapes we might say we’re all mad to a degree. We have our fixations, obsessions, relentless habits and cherished opinions. Some days it doesn’t take much to shove us a little further in one direction or another that may well land us outside what’s socially acceptable. The gods may be fine with our eccentricity. It’s other humans who get left shaking their heads — or burning down our houses and chasing us out of town. But in that madness, an ecstasy may empower you to open doors no one else can open, and you fulfill a great purpose that answers that “yearning to be free deep inside” which not just you but many feel. And like the leaves a tree drops each autumn, madness is one way to receive and transmute energy. After all, I ask myself, would I really value a religion or spirituality that doesn’t include an edge?! 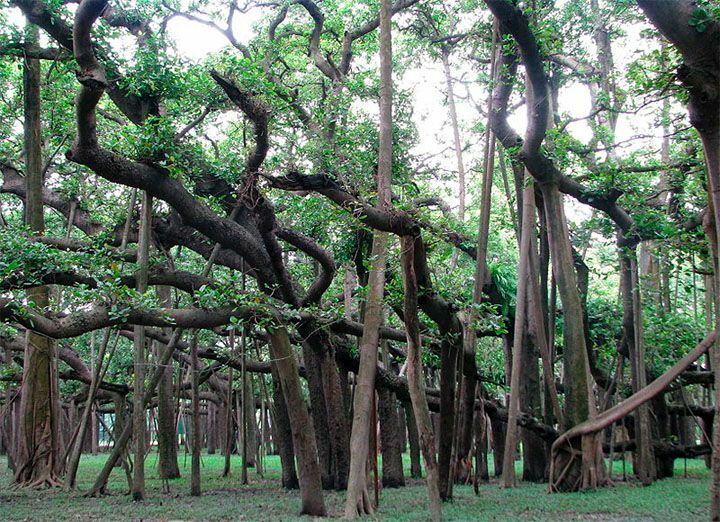 IMAGES: trees with aerial roots. Cindy, thanks for commenting. I first encountered the song in a Damh the Bard version on Youtube and THEN learned of Telling the Bees. The Bards lead us onward through such magical music.